I admit that myths don’t generally hold my attention. I skim them and never quite get to the end. But this? Oh, yes. 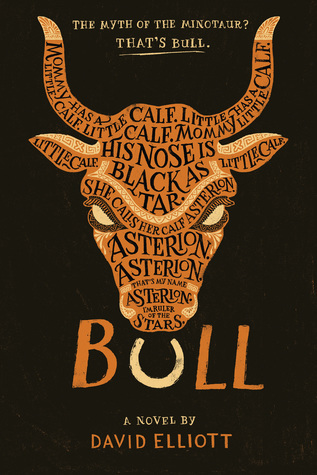 We watch Asterion grow up—sweet, kind, smart—and troubled. His mother loves him: “In his eyes/ I see the/ sun I see/ the moon I/ see the stars/ and all the/ tilted/ whirling/ galaxies/ I see the/ undiscovered/ constellations/ I see the/ Earth I see/ nations I/ see soil and/ root and branch/ and leaf I/ see fruit I/ see seeds of . . .” The lines of Pasiphae’s poems become shorter as the story progresses, giving us the author-intended feeling that she’s coming unhinged—“off her nut,” as Poseidon tells us. Poseidon reports on Asterion: “He’s the oldest of eight. That royal uterus is clearly first rate.” The other children—all wholly human—include daughter Ariadne and the super-athlete, Androgeos—Minos’s favorite. As for all stories that are passed along orally, there are differing versions, but in all, Androgeos dies young. In this version, it’s after competing and winning the shot put and javelin in Athens. Poseidon admits to having a hand in the death. Now King Minos hates Asterion—the monster, the minotaur—even worse. Minos has Daedalus, the royal engineer, build a dark airless labyrinth, where Asterion, now seventeen, goes mad. But Ariadne plans to save her sweet brother and together they will escape the island of Crete. See what I mean? It’s all so confusing. And who cares? (Sorry to you classicists). Poseidon is not done making mischief, ensuring the tragic ending. If you know your mythology, I’m giving nothing away. If you don’t know your mythology, this is the place to find out. It’s all in the telling.